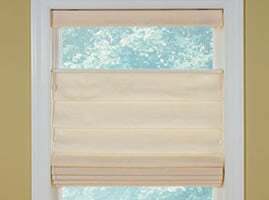 Raise and lower your roman shades using a remote control. Choose from a battery operated hand held remote or a wall mounted control. One remote control can operate multiple motorized roman shades at the same time. Perfect for those hard to reach windows or for child safety. 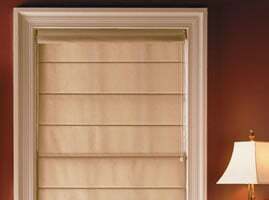 Below is a list of the blinds and shades that are available with the "Motorized" upgrade. You must select the upgrade when you add the item to your cart. Additional fees will apply for the upgrade. The hobbled or tear drop fold roman shades offer additional material between each panel of the roman shades for a fuller, richer look. The flat fold roman shades offer a more contemporary look with the fabric pulled tight between each of the panels. The doufold or top down bottom up system allows the roman shades to be both raised from the bottom up as well as lowered from the top down. This upgrade allows sunlight in while not completetly blocking the view. Because the shades are suspended when they are lowered from the top down the cords will be visible when the shade is in this position. Also there is a lift cord on each side of the roman shade. One to lower the shades and the other to raise it. Cordless roman shades are designed so the shades may be raised and lowered without the use of a lift cord. Perfect when no visible cords are desired. Reaching the roman shades to completely raise them may be dificult. With taller windows you will need to reach the top of the window because there are no cords. The rollease upgrade is designed for ease of operation on larger roman shades. 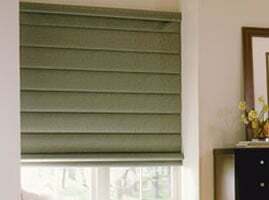 Because larger shades can be heavy the continuous cord loop make is easier to raise and lower the shades.